The Sunoco American Late Model Series Points Leader Brian Ruhlman led all but one lap of the 30-lap ALMS Feature at Oakshade Raceway on Saturday night. Unfortunately for Ruhlman, it was Jeep Van Wormer who led the final checkered flag lap. Ruhlman entered the night with a two point advantage over Aaron Scott in ALMS points. After starting on the outside of the front row in the feature, Ruhlman took control early. Van Wormer closed in after starting in the second row and pressured Ruhlman for the lead for the first 12 laps of the race. Ruhlman managed to open up some distance over Van Wormer while working through lapped traffic. Kris Patterson was closing in on the leaders while running in the third position, but then suffered a flat tire that knocked him out of competition late in the race. Van Wormer began to tighten back up behind Ruhlman in the closing laps. With Van Wormer closed right up behind him, Ruhlman got held up behind a slower car on the final lap which allowed Van Wormer to get alongside. The two came off the final corner side by side with Van Wormer taking the checkered flag and earning the check for $2,000 in a very exciting finish. Ruhlman ended up a close second in the caution free event. Greg Martin finished third with Aaron Scott and Casey Noonan rounding out the rest of the top five finishers. The great racing action continued in the Sportsman Feature event with multiple lead changes early in the race between Mike Jessen and Tim Fisher. Chris Keller restarted third after a caution on lap three and two laps later got to the inside of Jessen for the race lead. Finally, by lap nine, Keller assumed the lead but had Rusty Schlenk closing in quickly. Five laps later, Schlenk went high around the 67 car of Keller to take the lead for good. 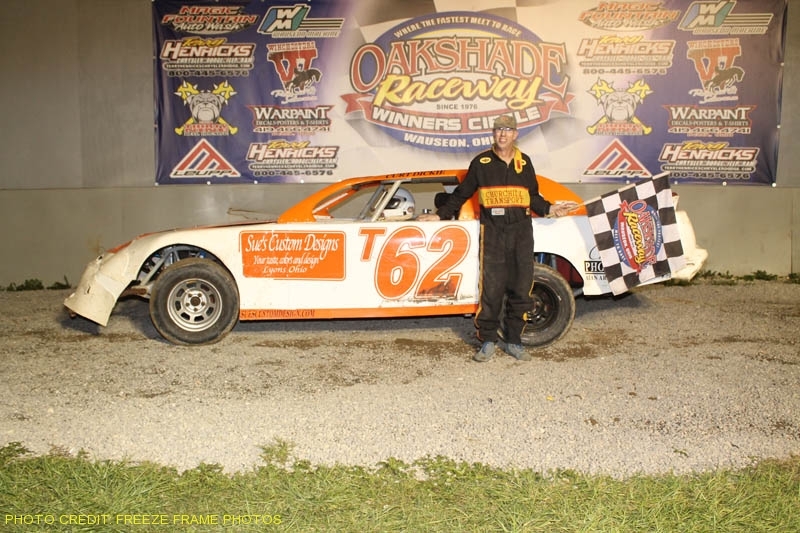 Schlenk went on to win his third consecutive Sportsman Feature at Oakshade Raceway with Tim Fisher just edging out Keller for the second position. Bruce Stuart finished fourth and Mike Jessen slipped back to finish fifth. Matt Shipley started from the pole in the Bomber A Main and led flag to flag to win his second A Main of the year. Jake Rendel didn’t make it easy though. Rendel followed in Shipley’s tire tracks the entire race until the final lap when he made the pass for the lead going hard into turn three. Rendel slid up the track in turn four and Shipley turned left back underneath Rendel and beat him to the line. Jim Scout was third followed by Craig Dippman, who started 22nd, and Todd Silvey. Gary Domoe took the lead from Karl Spores on lap two of the Bomber B Main and began to pull away. A caution for Tommy Huff on lap four tightened things back up. Domoe once again pulled away after the restart and went on to the easy win over Randy Roseman, Karl Spores, Kevin Hanford and Chris Howard. After a slew of cautions trying to get the Bomber C Main started, Rex Strow found himself out front when some green flag laps were run. A Paul Bickel spin on lap five brought out the yellow flag again. Andy Borton worked his way up to second after suffering some damage from an accident earlier in the race and battled with Strow for the lead after the restart. Borton eventually got by and pulled away a bit from Strow to pick up the victory. Eric Potridge finished third with Ted Hill and Rick Dippman finishing fourth and fifth respectively. Saturday, September 10 will be Season Championship Night at Oakshade Raceway for both the Sportsman and Bomber divisions.